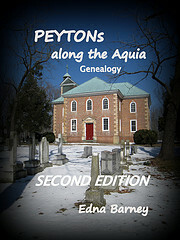 Anthony PEYTON (1801-1853) is a descendant of the PEYTONs Along the Aquia. He is a son of Thomas PEYTON of Mason County, Kentucky, whose lineage begins on page 60 of my Peyton book. Anthony PEYTON was born in Virginia and is believed to have died in Park County, Indiana. He is said to have married Margaret Wallingford in Mason County, Kentucky in 1818. I have found two sons for Anthony and Margaret: William PEYTON and James Franklin PEYTON who married Elizabeth RUSH. 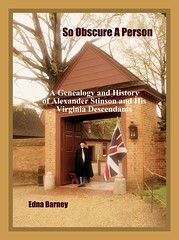 On page 44, of PEYTONs Along the Aquia, Doctor Valentine PEYTON, died on 10 July 1815, according to new research found on microfilm of the “Fredericksburg Virginia Herald” of July 19, 1815.